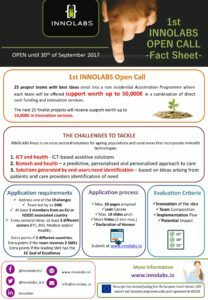 INNOLABS 1st Open Call for innovative projects in personalized healthcare is open from the 15th of June until the 30th of September 2017. The first Open Call is open to smart health solutions based on combination of ICT, BIO, Health and Medicine sectors. Proposed solutions should solve or meet the needs of ageing populations in rural and urban areas.